The burger: A new-to-Minnesota chain has landed in town, and what better place for a celebrity-backed burger joint than that massive intersection of celebrity culture, brand identity and shopping, the Mall of America? 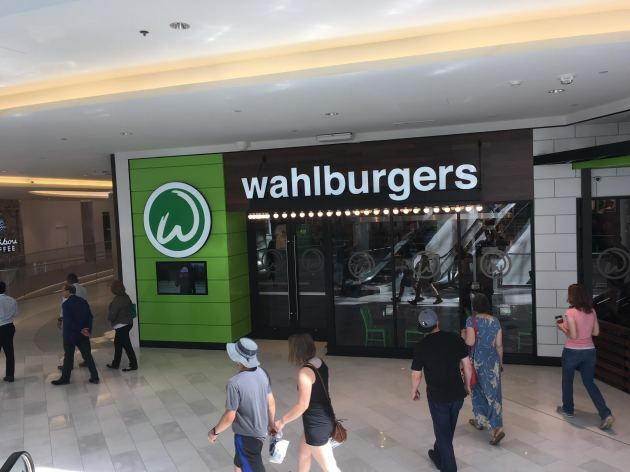 Wahlburgers, the work of chef Paul Wahlberg and his far more famous actor brothers, Mark and Donnie Wahlberg, opened at the megamall in late May. The restaurant, which features table service and counter service -- and a full bar -- is easy to find: it’s directly below Shake Shack. That's kind of like Walgreens moving in across the street from CVS, right? The company, which was founded in Boston in 2011 (and is the subject of an A&E Network reality show) currently operates 25 locations -- plus three food trucks -- in 13 states and Ontario, Canada. It’s about to get bigger. Hy-Vee is partnering with Wahlburgers in a franchising agreement to own and operate 26 outlets in eight states. The megamall location is the first, and Maple Grove is up next; the Twin Cities metro area should see a total of four Wahlburgers within three years. The menu offers a half-dozen salads, several non-burger sandwiches (panko-crusted haddock, a sloppy Joe), bacon mac-and-cheese, frappes and cupcakes – and a $6 kids menu -- but the main event is burgers. The one that I sampled? Impressive. And slightly out of the ordinary, in a good way, for a quick-service burger. (How quick? Mine clocked in at just under seven minutes). The standard Wahlburger utilizes a third-pound patty, but there are two variations: three-ounce patties in double- and triple-deckers (there are also bacon, mushroom, Southwestern and patty melt versions, plus a ground turkey burger and a veggie burger that calls upon the Impossible brand patty, all in the $8.50 to $11.50 range). Since the megamall is all about excess, I went with the triple-decker. 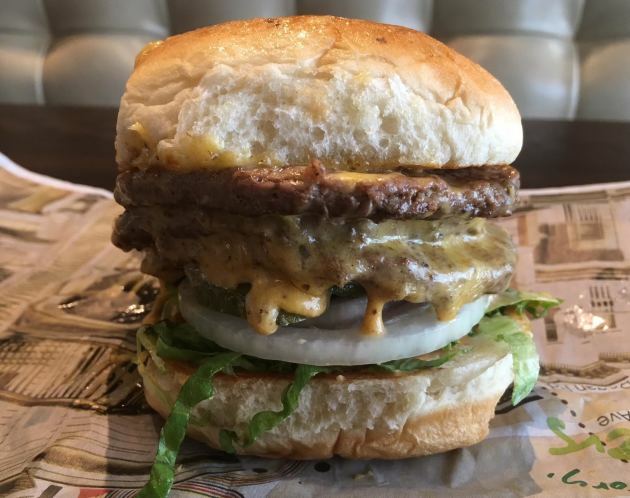 The patties – uniformly pressed thin and wide, wide enough to meet the bun's edges – are formed with a blend of chuck, brisket and short rib, a prescription that adds up to a full-bodied flavor and rich, juicy texture. They’re cooked to a medium (zero pink on the interior) but without the exterior forming any crunchy, flavor-boosting char. Sign up for our weekly roundup of what's new and hot in the Twin Cities bar and restaurant scene. The other noteworthy element is the bun. It’s soft, dense, a tiny bit doughy, slightly sweet and a bit yeasty, all qualities that make it stand out from the majority of its quick-service brethren. There’s almost too much bread – my Triple Decker stacked up to nearly the height of my iPhone, making me wonder how I was going to gracefully pick the thing up, let along consume it – but all of that beef and cheese mandates a sturdy foundation, so the ratio works. Garnishes are conventional: a few (decent) pickle chips, raw onion, a (not bad) tomato slice, enough chopped lettuce for show and a moisturizing swipe of “Wahl Sauce,” a Thousand Island-like concoction with pleasant mustard undertones. Oh, and layers (and layers) of cheese: gooey processed American cheese, or, in Wahlburgers parlance, government cheese. All in all, it’s a burger worth trying. A final note: the place was crawling with staffers, all of whom were so friendly, engaging and accommodating that their example silently encouraged my peevish self to make a greater effort in the stopping-and-smelling-the-roses department. Price: $10.50 for the triple, $9 for the double. The single-patty burger is $7.50. 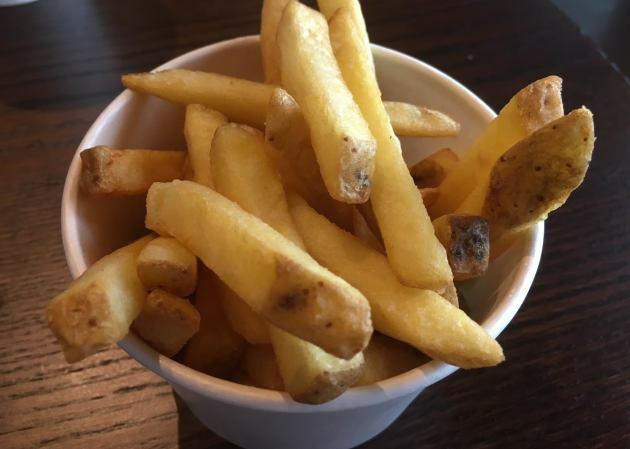 Fries: Not included; a side order is $3.50. It's a generous portion of thick-cut, skin-on Yukons. They’re billed as “crispy” but that attribute wasn’t particularly apparent. I’d skip them in favor of the onion rings. Address book: 234 North Garden, Mall of America, Bloomington, 952-854-1655. Open 10:30 a.m. to 10 p.m. Sunday through Thursday, 10:30 a.m. to 11 p.m. Friday and Saturday.